Monday, we meet again! Why is it that weekends tend to fly by so quickly? #lesigh It rained most of the weekend here in San Francisco so we spent most of our weekend cozied up in our apartment minus some outings for dinner and brunch. I pretty much binge watched Greys Anatomy all day Sunday and it was glorious. I stopped watching Greys around season 5 or 6 but I decdied to pick it back up and start from the beginning. I’m falling in love with McDreamy all over again ;) Sorry Warren! 01: Shaggy Coat – This is the shaggy coat of my dreams and it’s giving me allll the Penny Lane vibes. The dusty pink color is absolute perfection. 02: Celestial Slip On Sneaks – I have a thing for all things celestial and I think these slip on sneakers would make the perfect weekend wear! 03: Missoni Pillow – Yes, I’m aware the price is high on this pillow but this is a WISH list okay?! The subtle pattern and color way is just so gorgeous and would be the perfect accent on a couch or bed. 04: Beaded Chandelier – I’m always dreaming about replacing the ugly lights in our apartment and I think this beaded baby would look amazing above a bed or dining table! 06: Sweater – I have no shame in admitting I’m addiced to sweaters and the oversized buttons on the side are such a fun detail. 07: Woven Rug – For those intimidated by colorful rugs, this is such a good option! The subtle pattern will add just the right amount of texture to a room. I’m excited to bring you my second edition of weekly favorites! I’m always browsing and bookmarking my favorite pieces so it’s so fun for me to share them with you. Now only if I had the funds and space for everything I find - LOL! 01: Levi’s - I just purchased this pair and am so obsessed! New favorite pair of jeans that will be on major repeat. The distressing and fit is so perfect. 03: Cardigan - I love the large buttons and the soft pink is perfect to transition into spring. 04: Storage Cabinet - I have been eyeing this cabinet for SO LONG. We’re really needing storage in our dining area as our kitchen cabinets are completely full. I would store kitchen and miscelleneous items in here that I shoved in random drawers in our house haha. I hope to pull the trigger on this within the next few months! We just got to save up the funds first :) And although I’m wanting to use it in our dining nook now, I could totally see this in a living room or bedroom in the future! 05: Snake Print Booties - These are a knock off of a much more expensive designer version but I think they are so fun and trendy right now! 07: Juju Hats - And here’s another thing I’ve had my eye on (I’ve got quite the wish list if you can’t tell haha). I love the trio and the white with muted orange color combo. I think this would look so pretty above a couch, bed, or entry console! 08: Sunglasses - I used to have the round ray bans until I lost them for the second time (UGH) and am debating between these updated shape or the round! I think these are such a cool unique shape. I’m so excited to introduce you a new series on my blog called "weekly favorites!” Each Monday I’ll be sharing some of my favorite items I’ve been wanting, own and love, or just give me inspo! Every round up will include a mix of home decor, clothes, accessories and etc. 02: Warren actually bought me this pair of glasses for Christmas! The style is called the “ Blair” so I immediately loved them :) Now I just need to get my prescription I’ve been putting off — finally have an appt to get my eyes checked this week! 04: Been obsessing over these leopard jeans. Neeeeed them in my life! 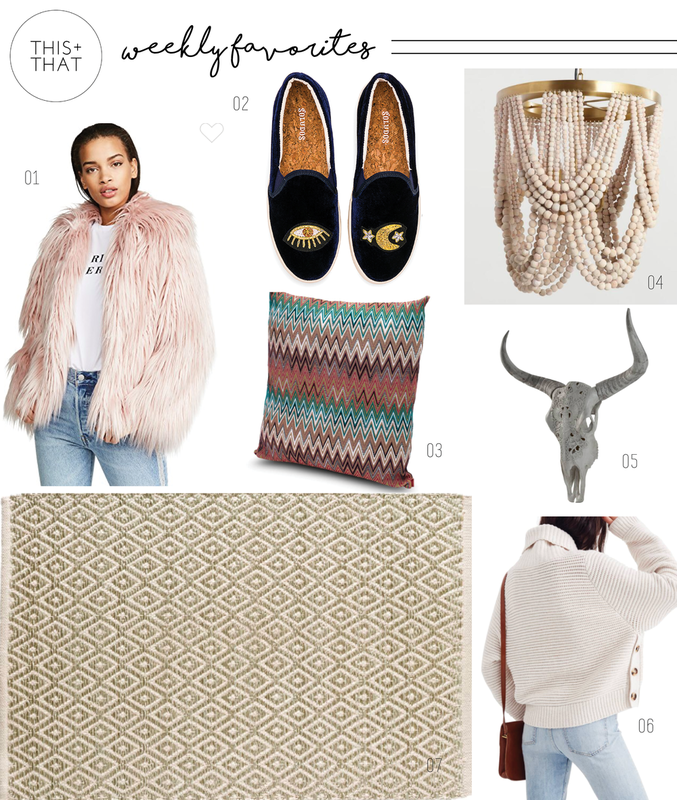 05: Love this chic moroccan style throw blanket! Would be cute for the couch or at the end of your bed! 06: Just bought this faux fiddle leaf fig! Love it and think the quality is pretty good for a fake plant! 07: Snake print is so in right now and I’m loving these loafers. Would be so cute with jeans and a chunky knit! 08: The colors in this rug give me all the feels. Kinda want it for my bedroom…. but Warren wont let me buy another rug. RUDE. Shop all the products in the collage by clicking on the images below!